So much new! Amtrak Coast Starlight recently started allowing roll-up bike service (previously bikes had to be boxed) and while I’ve heard from lots of people that the Coast Starlight often runs late, I couldn’t pass up a chance to give it a go because all our past trips have been aboard the Amtrak Cascades line. Also, PETS CAN RIDE NOW! Just small pets, but my pet is small! LOOK: Pets are free if you book in the next few days! Otherwise it’s $25. 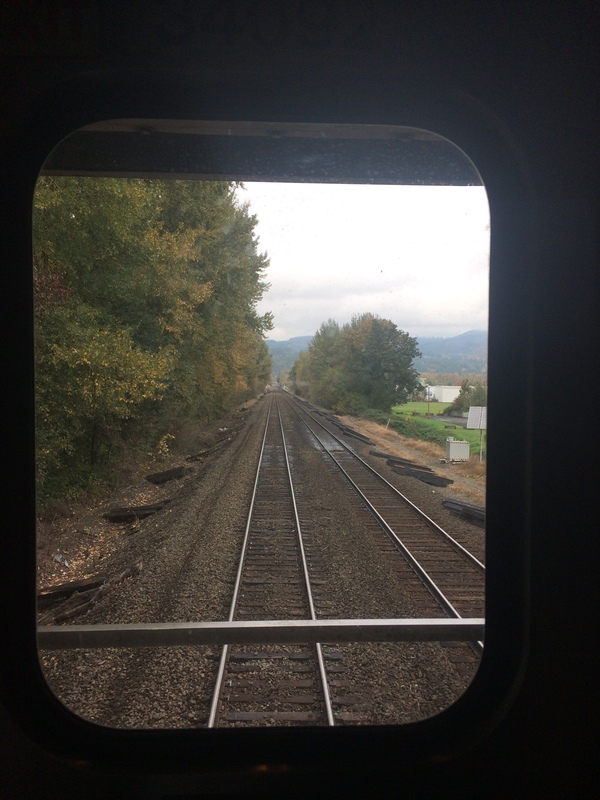 So I packed up bike and dog and headed down to Portland for a weekend recently: Coast Starlight on the way down, Cascades line on the way back up. All my stuff is in my two big panniers (Swift Industries Roll Top Panniers), Pixie’s in the front basket, Timbuk2 Muttmover Backpack is bungeed atop my rear rack. Pixie was required to be in a carrier while moving around the train, but it was OK for her to sit on my lap–though not directly on a seat–so I used the backpack for boarding and walking around the train (to and from observation car, restroom, and cafe). The first thing I noticed as I wheeled my bike halfway to Tacoma to reach the baggage car at the front of the train was that this was a loooooong train. Amtrak Cascades is short with the baggage car at the back, right by station. I’m not sure this is intentional for passengers with bikes, but I’ve always been seated in one of the closest two cars. 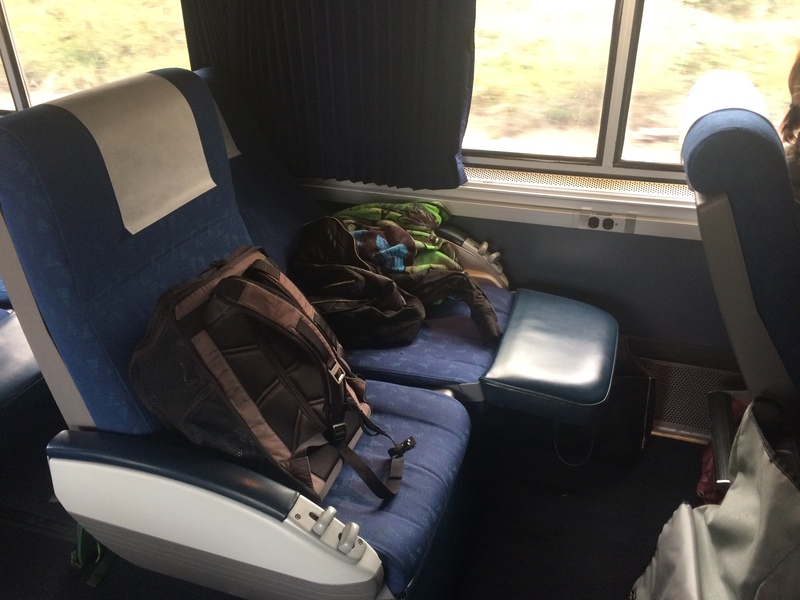 I upgraded to business class once when it was really cheap, but after having to lug my heavy panniers the length of the Amtrak Cascades train I realized it wasn’t worth it. This train was sooooo much longer than that. 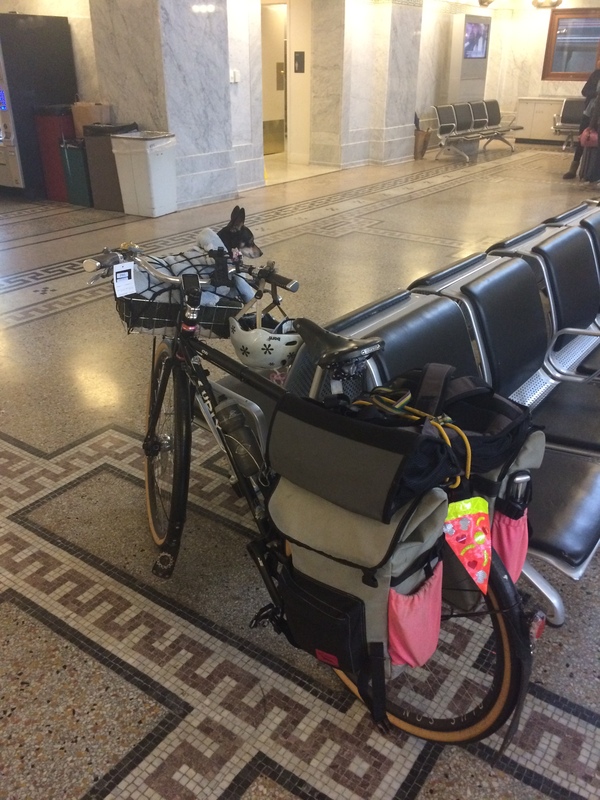 I really don’t like carrying my panniers around, but stronger people, or those with lighter panniers, might not think this is worth consideration. 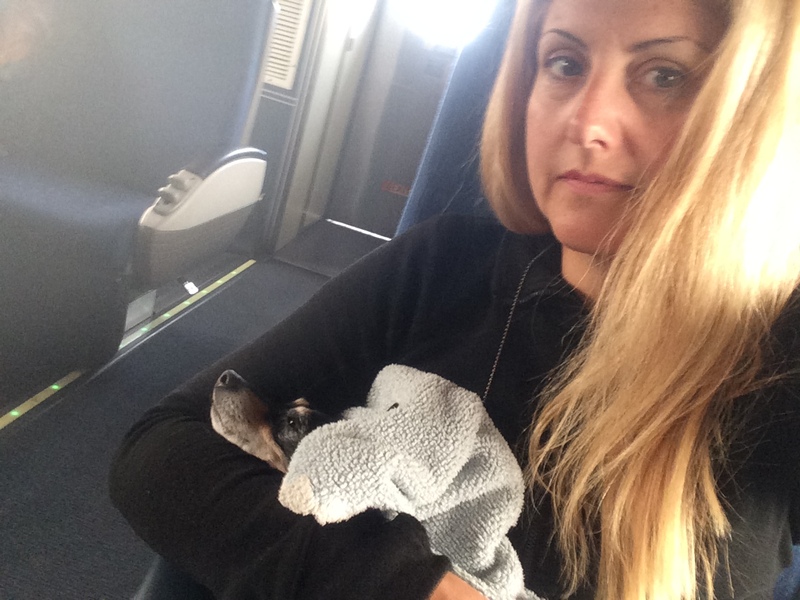 Coast Starlight only offers Wi-Fi in business class. I’m not sure if Cascades’ patchy Wi-Fi is better or worse, though. I always think I’ll get tons of stuff done aboard the train and spend most the time frustrated at the Internet connection. I’ll admit it was relaxing leaving my laptop off, but it might keep me from using the Coast Starlight unless I’m going farther than Portland. Amtrak Cascades has additional seating in the cafe and dining cars, but I’ve only once scored a seat. This observation car was huge with plenty of available seating. It’s like a real train! There are stairs! Very narrow stairs. And the restrooms are all downstairs so you don’t get to stay up top once you’re up. 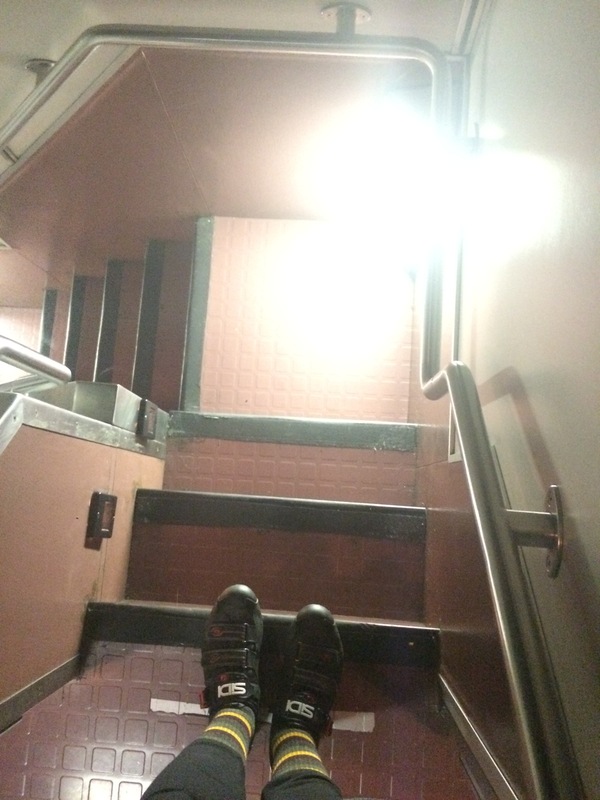 There’s some seating downstairs, but it looked pretty dark and lonely. There is tons of legroom because the seats almost fully recline. 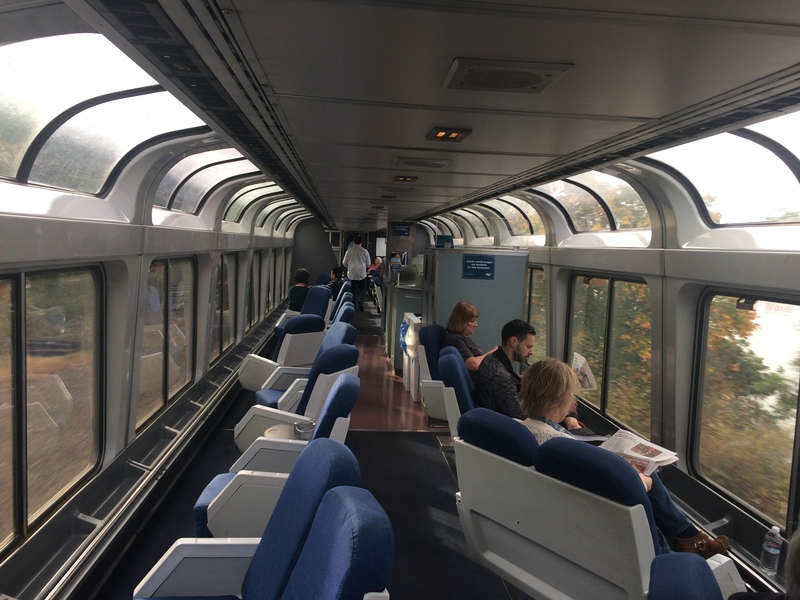 There are sleeper cars, too, and were I traveling all the way to Los Angeles with the kids (which I think would be fun, but exhausting), I’d want to splurge on one of those, but a lot of long-distance passengers opted to ride in the cheap seats. It was neat sitting with people embarking on such a big trip. The woman next to me was on her way to LA and said they wouldn’t arrive until 9pm the following night (or probably later considering we were over an hour late to Portland). One cool thing about having the baggage car at the front of the train is that there’s a great view out the back. The view of one’s bike hanging in the dark baggage car at the back of Amtrak Cascades is cool in a different way, but this view is out-of-a-train-movie cool, right? ← Happy Fifth Birthday, Big Dummy! I took the Coast Starlight with my bike back from a ride in California last year. The business class WiFi is nothing to write home about — it’s just a Verizon “Mi-Fi” device sitting on the back wall of the car inside a plastic bubble. Same sort of thing you’d get by tethering your phone. Same lack of coverage you’d expect with your phone as well (which is actually quite a lot). Having boxed up a bike twice on the Coast Starlight (and had to bring a pedal wrench the entire trip), it’s great to hear this is no longer needed! It looks like there is an extra $20 charge to add a bike to Davis, CA. 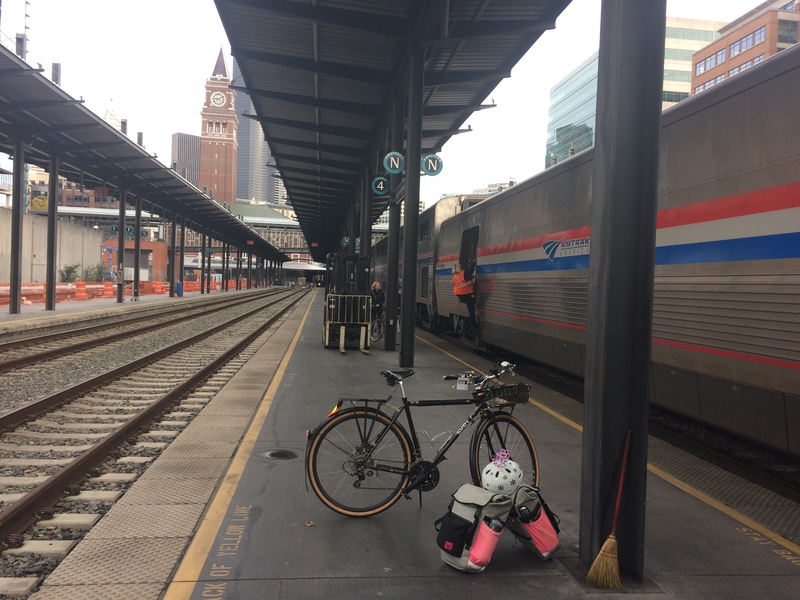 Is the bike charge that much on the Coast Starlight if you are only going to Portland? Oh, I didn’t realize the price varies! It was $5 for Seattle to Portland.